Jumping Sudden Death is one of the minigames only playable in the Vs. Battle mode of New Super Mario Bros., in the 1 on 1 category. The objective of this minigame involves the players attempting to avoid the spikes at the bottom of the screen for as long as possible by jumping. 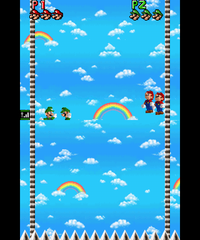 Player one controls two Marios, and Player two two Luigis. The player can jump by tapping their bro once one of them reaches the Touch Screen with the Stylus. Each player has three lives, and the player that loses them all first loses. "Keep bouncing higher to avoid those spikes coming up at the bottom of the screen! P1 is Mario, and P2 is Luigi. Tap your bros to make them jump. Whoever survives longer is the winner." This page was last edited on May 1, 2017, at 19:30.